Not all project bikes are built the same. There is a great disparity between the haves and have-nots in the high-dollar game of creating the ultimate motorcycle. Money is usually the driving force, but a project build can go wayward without vision. 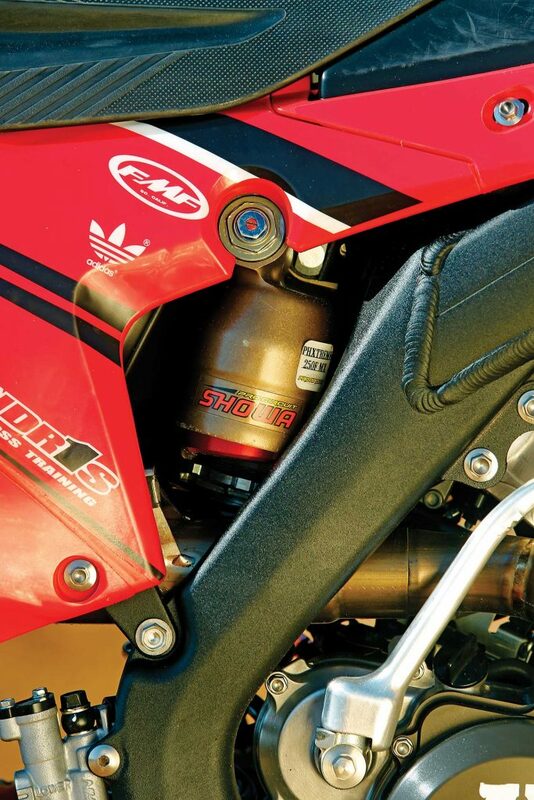 MXA test riders are guilty of blowing through their savings accounts buying aftermarket parts, only to realize their mechanical compass was off. The mighty dollar may rule the world, but it does not control who wins on the racetrack. 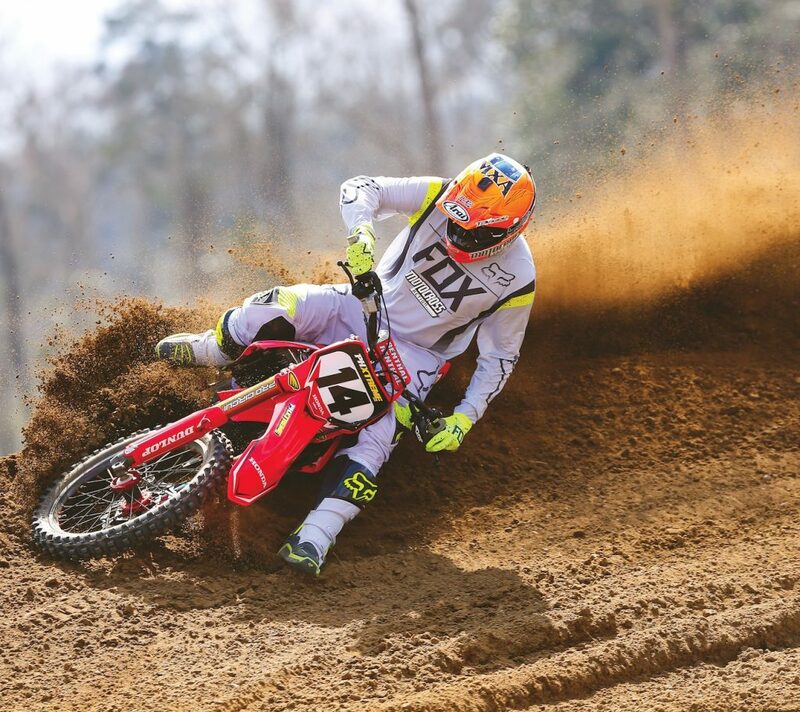 Because MXA is the leading motocross publication in testing bikes and products, we are often petitioned by industry magnates, race teams, aftermarket companies and friends to test their project bikes. While we’re flattered by the opportunity to destroy someone else’s bike, most requests are turned down. Enough project bikes have rolled through our pit area for us to realize that simply bolting on parts and slapping stickers on new plastic doesn’t move the needle. YOU’RE PROBABLY WONDERING HOW A MOTORCYCLE SUPERSTORE IN MIAMI COULD POSSESS FACTORY EQUIPMENT, DESPITE THE FACT THAT HOLGADO DOESN’T FIELD A PROFESSIONAL RACE TEAM. We’re constantly searching for the unobtainable and the overwhelmingly unique. That’s where Pablo Matador Holgado, owner of the PHXtreme motorcycle superstore in Miami, Florida, comes in. The Argentinian asked us about testing his prized Honda CRF250, replete with factory Honda footpegs, the latest Showa A-Kit air forks and enough titanium to build an SR-71 Blackbird. After we got the call we were on the next flight to Tallahassee, Florida, where we ventured out to Climax Motorsports Park in Climax, Georgia, to test Holgado’s $53,000 Honda CRF250. You’re probably wondering how a motorcycle superstore in Miami could possess factory equipment, despite the fact that Holgado doesn’t field a professional race team. Ever the businessman, the Argentinian moves more Troy Lee Designs gear through his store than Donald Trump quotes make headlines. As a result, Holgado was noticed by Troy Lee, and the two struck up a conversation about the TLD race team. Troy was in the process of switching from Honda to KTM factory support and was cleaning out his CRF250 inventory. One thing led to another and Pablo Holgado purchased Cole Seely’s 2014 Honda CRF250 from Troy Lee for $18,500. The bike included factory Honda footpegs (rumored to cost $5000) and a bunch of other trick components. Fast-forward a year later and Holgado purchased Malcolm Stewart’s Geico Honda CRF250 from James Stewart Sr., also known as “Big James.” This wasn’t actually the first Stewart bike Pablo had acquired from the Stewart camp. His crown jewel is James Stewart’s factory Kawasaki SR125, which hangs from the ceiling directly above the showroom entrance to the PHXtreme superstore. Holgado and the Stewart family formed a friendship through multiple business transactions, and Pablo frequents Bubba’s Haines City, Florida, slice of motocross nirvana. A telling sign of fork exotica is the aquamarine coating. These forks were off Malcolm Stewart’s old race bike. This is where things get really interesting. Holgado, seizing the opportunity to blend race parts into one ultimate machine, poured a ridiculous amount of money into a stock 2016 Honda CRF250. The end result is what you see here—a CRF250 that is on par with what factory-backed race teams roll through the paddock. Pablo’s creation includes factory Honda footpegs, Showa A-Kit shock and air forks (off Malcolm Stewart’s race bike), thousands of dollars in titanium, and enough aftermarket parts to push the total cost of the bike up to $53,000. Engine: Jason Rosete, a former wrench for Ian Trettle, Nick Paluzzi and Hunter Hewitt, has a wealth of experience working on race bikes. 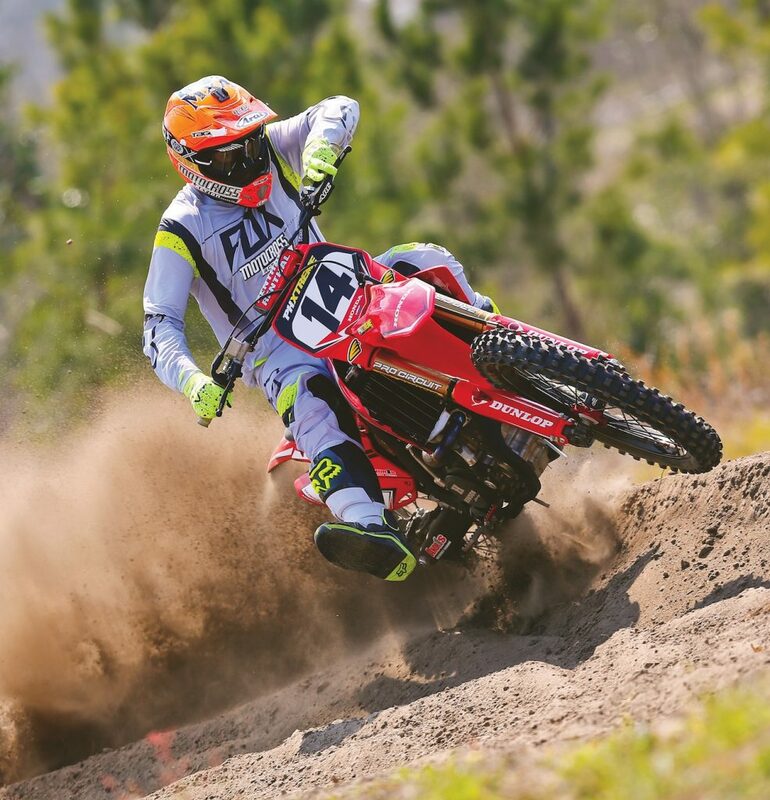 A native Floridian, Rosete did all of the dirty work on the CRF250. Everything that could possibly be done to the internals was achieved with copious amounts of greenbacks via Holgado’s wallet. The transmission and shift mechanisms were R.E.M.-finished; the crankshaft was balanced and trued; both cases were polished and deburred; Del West titanium valves were installed; a Pro Circuit camshaft with proprietary springs and titanium retainers replaced the stock components; and the intake tract was blueprinted. Naturally, the cylinder head was ported for better performance, and a custom JE piston is responsible for pumping up the combustion in the top-end. Those modifications would be enough for most thrill seekers. But not for Pablo Holgado. He enlisted Wade Wilcox from Injectioneering to modify the fuel injector. Tokyo Mods customized a Vortex ignition for the perfect balance of power and performance. Pablo even had Jason Rosete get the frame, subframe and swingarm powdercoated black to the tune of $900. Not only does the bike romp around the track, but it’s a show pony in the pits. If you’re interested in spending thousands of dollars in hop-up parts, all you need to do is embrace Holgado’s spending habits. He drop-kicked the stock wheels for Excel A60 rims and Talon carbon fiber hubs from Dubya. In place of the heavy CRF250 dual exhaust is an FMF titanium Factory 4.1 dual system with carbon fiber end caps. The stock red-and-white plastic was too dull, so he brightened things up with a complete Cycra Racing plastics kit. 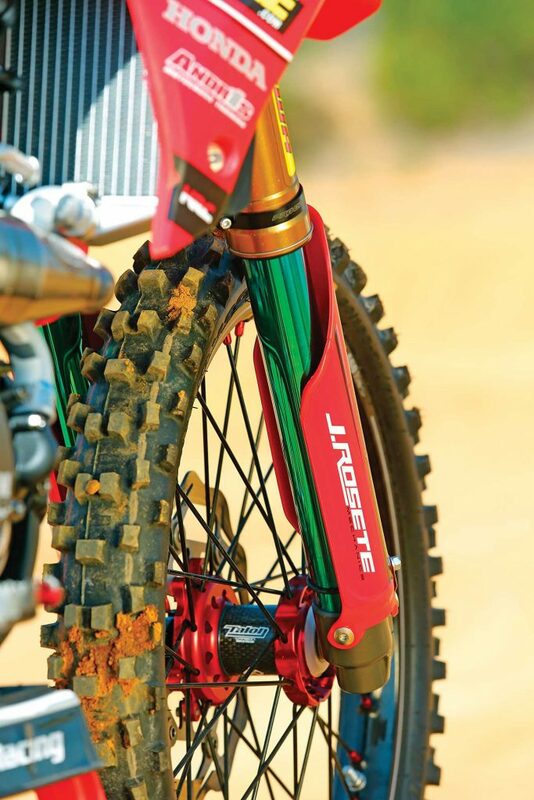 To complement the $9000 Showa A-Kit forks, he used XTrig ROCS triple clamps. Additional features include a Pro Circuit holeshot device, Samco water hoses and Lightspeed carbon ignition cover, rear caliper, and case guard. Twin Air handles the air filtration, while a Braking oversize front rotor and standard rear disc bring the bike to a stop. Renthal sprockets, handlebars and grips are the main creature comforts, although the same cannot be said about the Acerbis X-Seat. Other products include a Pro Taper chain and throttle tube; TM Designworks Slide-N-Glide kit; ARC folding levers; and a Hammerhead brake pedal, shifter, case saver, axle blocks, brake clevis and oil filter cover. A healthy dose of cash was put towards a complete Met-Tek titanium bolt kit. At one point Holgado dropped an 8mm titanium bolt while removing the seat. He quickly picked it up and said, “That right there is $7.” The bike was buttoned up with a custom PHXtreme graphics kit. It’s not rare for the MXA wrecking crew to test a bike with so many hop-ups, but to do so at a pristine track in southern Georgia is rare. Pablo Holgado’s 2016 Honda CRF250 very well might be the most expensive 250 four-stroke we have ever tested—short of a factory bike—and for that we are thankful. The next time we visit Florida we’ll be sure to check out Holgado’s motorcycle superstore in Miami. Who knows? Maybe we can convince Pablo to lower James Stewart’s factory Kawasaki SR125 from the ceiling and put some premix in the tank. For more information on PHXtreme, visit www.phxtreme.com or call (305) 594-2284. You can also swing by their superstore in Miami, which is open six days a week.